(Left to right) Nancy Cox, college dean; Tom Riddle, veterinarian; and Mick Peterson, director of UK Ag Equine Programs. Photo by Matt Barton, UK Ag Communications. LEXINGTON, Ky., (Sept. 27, 2017) — Breakthrough research and one-of-kind educational opportunities don’t happen by accident or in isolation. They are accomplished in concert with industry stalwarts who give of their time, talents and wisdom. One such linchpin, Lexington-based veterinarian Tom Riddle, was recently named the 2017 Friend of University of Kentucky Ag Equine Programs. The award recognizes the many impacts he has had on equine research and education within UK’s College of Agriculture, Food and Environment. Riddle, who co-founded Rood & Riddle Equine Hospital in 1986 and specializes in reproductive veterinary medicine, has actively served for decades in many advisory capacities for equine research and education at UK. Riddle was nominated for the award by Laurie Lawrence, professor within the college’s animal and food sciences department, in conjunction with David Horohov, chair of the Department of Veterinary Science and director of the Gluck Equine Research Center; Jamie MacLeod, professor within the Gluck Center; and Jill Stowe, agricultural economics associate professor. According to the nomination, Riddle has ensured that his practice is accessible and supportive of UK’s teaching, outreach and research missions. He generously supplies speakers for undergraduate courses and outreach activities and has served as a sponsor for conferences and events organized by UK. Additionally, the hospital accommodates many interns each semester, provides essential experience for preveterinary students, and hosts educational tours and demonstrations at its facility. 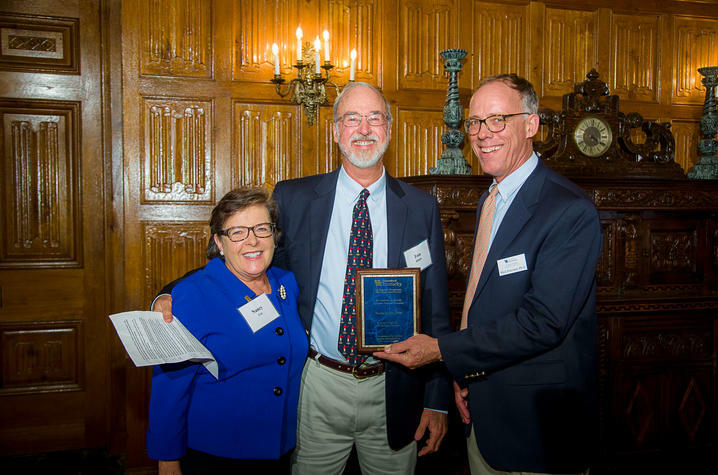 Rood & Riddle provides annual support for an equine scholarship and for equine clubs’ and teams’ activities, and Riddle was a major advocate and contributor to the renovation of UK’s equine reproductive research facilities. Additionally, he has served on the college’s equine advisory committee from the very start. Known for being humble and quick to give others credit, Riddle’s response to being recognized with this award was characteristic. Dean Nancy Cox recognized Riddle’s contributions to UK Ag Equine Programs. These sentiments were reflected many times over from those who nominated him for the award. “It is humbling to look at Dr. Riddle's international contributions during his career. However, with everything he has done, he has consistently contributed to the success of the UK Ag Equine Programs. It is hard to imagine someone more worthy of this recognition,” said Mick Peterson, director of UK Ag Equine Programs. The Friend of UK Ag Equine Programs was created in 2005 to recognize a member of the public who has provided advocacy, funding or other extraordinary support, or a college or university employee who has generated an exceptional relationship with stakeholders that manifested into a new program, new advocacy success or new resources for the program. Past Friends of UK Ag Equine Programs include Matt Koch, of Shawhan Place Farm; Bennie and Cheryllee Sargent, of Sargent Quarter Horses and coach of the UK Equestrian Team, western division; Stuart Brown, a Lexington-based veterinarian specializing in equine reproduction with Hagyard Equine Medical Institute; Norm Luba, executive director of the North American Equine Ranching Information Council and current chair of the UK College of Agriculture, Food and Environment’s Equine Advisory Committee; Dan Rosenberg of Rosenberg Thoroughbred Consulting; Northern Kentucky county extension agent trio Don Sorrell of Campbell County, Dan Allen of Kenton County and Jerry Brown of Boone County; and David Switzer, former executive director of Kentucky Thoroughbred Association/Kentucky Owners and Breeders Association. For more information about UK’s Ag Equine Programs, visit www.ca.uky.edu/equine.